What does 🎒- Backpack Emoji mean? The school bag emoji or backpack emoji depicts a small backpack, one more suitable for school kids than for adult backpackers. The emoji varies in color and style from platform to platform and is used in posts related to school and school sports, to bag fashion, and to street culture. The backpack emoji is part of a group that includes coin purses, handbags, luggage, and briefcases. On various platforms, this emoji appears in a range of colors and styles, with LG’s looking like a rectangular, red box and WhatsApp’s being a more realistic version, an orange bag with straps and zipper compartments. Some claim there is a need for more adult versions, both a hiker’s backpack and a more “street” kind of backpack, which is used widely by young people everywhere. This emoji was first approved under the name “school satchel” as part of Unicode 6.0 in 2010 and added to Emoji 1.0 in 2015. 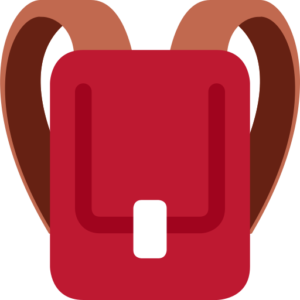 The backpack emoji is used in things related to school and to school sports, especially high school and college football. The emoji also appears in social-media posts, especially on Instagram, relating to adventure, or travel. The emoji is also used in fashion-related posts that deal with both streetwear and high-end backpacks and bags, and it has been adopted on Twitter in reference to the street slang “the bag,” which implies large amounts of money, and possibly drugs, with a bag being the vessel of transport. New #Thr33z Money-Route #backpack only at the official Thr33z website Thr33zclothing.com show some love like and follow @thr33zclothing yuuurrpp "I had 2"